Winter Wyoming camping can be a wonderful way to relax before the madness of the holidays sets in. Wyoming has much to offer, with an array of State and National parks for campers to enjoy during their break from the hustle and bustle of everyday life. Previously we covered some of Wyoming’s great State Parks, but the Cowboy State has even more to offer with its beautiful National Parks. Our Budget Campervans are perfect to get you where you want to go for winter Wyoming camping, without breaking the bank just before the season of giving. Fall and winter campervan rental rates start at only $37.99 a day. That’s a 76% savings off our summer rates! 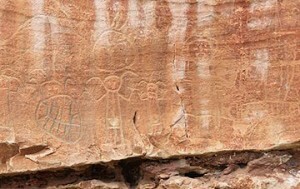 Fossil Butte has Much to Offer! 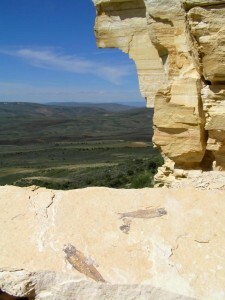 Fossil Butte is home to an astonishing collection of well preserved fossils of all kinds! Plants, animals, and even insects from the past can be seen preserved in rocks for visitors to see when they visit this unique park. Camping is located just outside of the area, so this park may make more of a pleasant day trip than an extended say- which is perfect for our campers. Our Campervans allow you to travel whenever you like, and Wyoming has much to see! The Devils Tower is a unique geologic formation that will leave you in awe. There are several hiking trails to take around the Tower to see it at its fullest, and one of the trails even leads right up to the Tower’s base. Devils Tower holds spiritual significance with many Native American tribes, and with a presence like that it’s no wonder that it does. The park’s campgrounds close in October, but Devil’s Tower is definitely a must-see for anyone venturing into Wyoming. Local camp areas can be found in the Devil’s Tower KOA, Belle Fourche River Campground, and Devils Tower Tipi Camping. 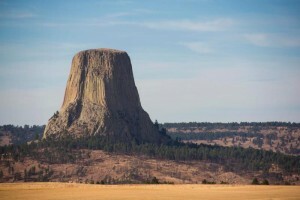 Check Out This Cool Video on Devils Tower! Grand Teton is probably one of the more well known parks in Wyoming, and it’s reputation is well deserved. Home to gorgeous plant life and awe-inspiring mountains, Grand Teton is unquestionably one of the best camping spots Wyoming has to offer. Skiing, snowmobiling, dog sledding, sleigh rides and snowshoeing are just some of the activities that campers can enjoy in this gorgeous park. A Lost Campers Campervan can get you there for your Winter Wyoming camping adventure at a deal that’ll leave plenty left over for souvenirs! Our Salt Lake City depot is only 3 – 9 hours drive from these popular Wyoming winter camping adventures. Our daily rates are at our lowest price from November – March, about 76% off our summer campervan rental rates, so get your quote today! Wyoming is a popular destination for summer camping, but Fall Wyoming camping is just as fun! With temperatures dropping, the busy summer crowds clear out, making an ideal time to go check out the changing scenery in one of Wyoming’s many beautiful State Parks. Our Salt Lake City depot is perfectly placed to reach these wonderful destinations. 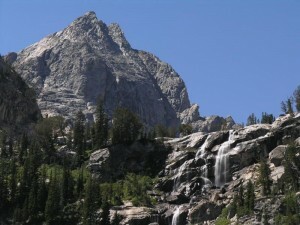 On average, it’s only about a 6 hour drive to get to your next vacation spot in Wyoming. See the Google Maps below with markers for all three Fall Wyoming camping state parks. Boysen State Park is home to all sorts of fun activities. With hiking, fishing, swimming and much more you’ll have a hard time running out of things to do. Explore the area around the park to check out the beautiful forests and unique geological formations. The Wyoming park even has a showering station for those campers that want an extended stay! Of the almost 300 campsites available at Boysen, most do not require a reservation, and with a Lost Campers budget campervan rental, you can easily secure a regular camp spot without having to worry about the extra cost an RV site would garner. Medicine Lodge Archaeological Site is another fun stop with much to do! It’s home to a large cliffside with petroglyphs that are over 10,000 years old- definitely a must-see for those that are interested in the unique and special history of the area. The park also makes a great place to really get into nature, with many native species to observe! Red deer, elk, and moose live in the area. For those interested in horseback riding, the park offers many horse trails to explore during your stay. A Lost Campers campervan is a convenient way to enjoy everything this Wyoming park has to offer- all without having to worry about leaving anything out at your campsite while you’re away- our vans have plenty of storage! Sinks Canyon State Park has quite a bit to offer! 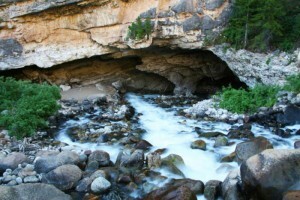 The park features the Popo Angie River, which disappears into a large cavern inside of the canyon, then reappears in a pool filled with trout around half a mile down the canyon. The park gets its name from this formation – its called the Sink and Rise. The park is teeming with wildlife from black bears, to moose, and even golden eagles! You’ll find plenty to do at this park, and one of our campervans can get you there to do it all. Fall Wyoming camping is made easy with our low daily rates! Get your budget campervan quote from us today, the fall season is booking up fast!